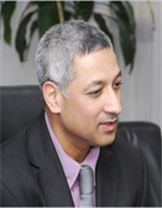 Currently University of Bahrain Associate Prof. of Cybernetics & Robotics, and a candidate for the full rank, Professor. Career pathway back on 1986 as received University of Bahrain Bachelor of Science in Electrical Eng., pursued studies for MSc. in Electronics in 1988, University of Southampton, 1994 awarded University of Reading Ph.D. in Cybernetics, Robotics Control. Worked on (12) research projects, including King Saud University Robotics Project, KSA. Supervised (Ph.D., M.Sc., + 50 Undergraduate). Editor board member of 16 journal & conference. Awarded (14) awards, University of Bahrain, best research in 2001, 2002, 2006, & 2007, Bahrain Police Academy Award (2012), and others research related awards. Back in 2001 with 30 others from Gulf Region, chosen for the Gulf Executive Program conducted in USA, and received MBA from Darden School, Virginia University. Holds other short qualifications after as well. Have interests in Cybernetics, Robotics, Computational Intelligence, and Control. Lecturing within such areas for a number of years. Chairing Continuing Engineering Education Dept., (1998-2002). Chairing Electrical and Electronics Engineering Dept., (2004-2009) and (2011-2013), University of Bahrain. During 2011-2013, was seconded to Bahrain Training Institute, as the Institute Director General. Headed large number of committees, including ABET accreditation committee for 3 terms, (2005-2014). ABET accreditation expert, as leading a team for positive full Electrical Engineering and Electronics Engineering Programs accreditation over 2005-2010. Run 20 Engineering & Educational short courses and workshops in the area of engineering control-automation, ANN, Matlab, Mathematica, Labview, LaTex, IMSL, & NAG libraries. Member of Bahrain NATIONAL Higher Education Skills-Innovation Steering Committee. IET active member & member of IEEE, IFAC & BSE. Organizing chair of 2 large conferences, technical events, & 8 IET symposiums-colloquiums in Bahrain.